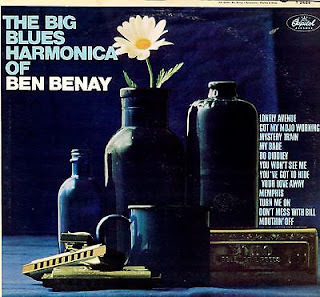 Studio group fronted by Ben Benay on harmonica. With: James Burton, dobro; Sugarcane Harris, violin; Don Preston, guitar; Jerry Scheff, bass; Mike Deasy, guitar; Mike Henderson, organ; Butch Parker, piano; Jim Troxell, drums. Not everybody plays on every track. Produced by Gary Paxton, who, along with Benay, Deasy, Henderson, Parker and Troxell also collaborated on the "Friar Tuck And His Psychedelic Guitar" LP cut for Mercury the following year. Vinyl plays a strong VG+ and the cover is in excellent condition...a small bit of ringwear across the top front cover. The sound sample begins with one of two original tunes on the LP, "Turn Me On", then "My Babe", both of which feature Sugarcane Harris, then "Mystery Train" with Burton&apos;s dobro, and concludes with "Got My Mojo Working".